If you are a franchise owner, or even the owner of a multiple-location local business, search engine optimization has its own set of issues and challenges for your business. The truth is that there are more brands than ever competing for search engine visibility. Having corporate-backing from a franchise model doesn’t always help with local SEO. Plenty, and in this post I’ll outline 5 of the top ranking factors you need to be aware of when it comes to your franchise SEO efforts. A lot of the work I will discuss wades into the realm of content marketing. That’s the area you want to focus on moving forward. On the other hand, many sites are still dealing with problems of inaction, or lingering issues from past SEO campaigns. You’ll need to address those immediately. As mobile and content marketing continue to dominate, you need to make sure that old-school SEO tactics are not holding you back. In July, there was an SEMrush article that laid out the following problems SEO franchises run into. You’ll want to “focus on and take caution of” these things. Why? Because they could account for some of those nagging SEO issues that are weighing down your rankings. The bottom line is that you need original, useful content on each page rather than thin or duplicate content that is republished over and over again – especially on location pages. Consider each location page to be a mini-website for that location and fill it with rich content, such as a unique description, a video(s), and images. Regarding on-page SEO, you need to “remove all unnecessary interlinking” and do a backlink audit to ensure your site is up to snuff. If you have the resources, hiring an SEO expert to perform a comprehensive SEO audit is a good idea. That’s what the above SEMrush post suggests, and most in the SEO industry will tell you the same thing. So…what does such an expert cost? Typically you’re looking at a couple thousand dollars or more for a professional SEO audit…and that’s if you have a small site. Big sites, or those with lots of backlink clutter, will take more time and effort. Can you do some of that auditing yourself? I’m willing to bet you can. A good place to start for a DIY backlink audit would be this 2014 Moz link audit guide. Now that you’ve cleaned up and addressed your site’s link issues, how else can you get ahead? The answer is with mobile. More and more it’s about capturing mobile users. In October, it was reported that mobile searches surpassed desktop searches worldwide, with more than 50% of search queries coming from those platforms (tablets and smart phones). Another tip the SEL post offers is to “localize with purpose,” meaning all your pages should have unique H1 and H2 titles as well as specific and SEO-friendly URLs. These are great things to think about for your ongoing SEO and content marketing efforts. Both will be needed to achieve and maintain organic search engine visibility in the future. I’ll finish up discussing those last three bullet points. For location pages, it’s critical that you provide Google with detailed, accurate information about all your physical locations. This is even more critical now with Google My Business pages and the overwhelming rise of mobile over desktop for search. Google is factoring in all kinds of location-specific information when analyzing a query made from a mobile device. The better your business can tap into this trend, the more online leads you’ll get. Those are the big four that Google wants to see consistently, and guess why? Your customers demand quick access to them. Many times when they type in a business-specific word, like your name followed by a location, it’s a strong signal for your business address information. Yet, many businesses do not track and monitor their NAP (Name Address Phone Number) listings. This is especially important for franchise SEO, and a key factor to help businesses get ahead online. You can take NAP listings a step further to gain more real estate in local SERPs (search engine results page). Check out this post I did a few months ago on SERP Stacking and get some pointers on how to increase your company’s chances to show up several times on the first page of Google. When it comes performing SEO tactics, you want to make sure you’re not duplicating efforts or wasting resources. Why have one franchise spend have a day on a social media campaign when another did the same thing the day before? Think about ways to consolidate efforts to unlock the power of the network effect that is inherent in every franchise business. To the extent possible, make sure your franchise locations are talking with one another so you’re not doing the same thing over and over, or stepping on each others’ toes. 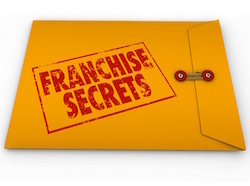 There are many ways for franchise businesses to improve their search engine rankings. Simple changes to your website and a commitment to content marketing will help your franchise get ahead online. Also, giving Google crystal clear information about your business listings is key to any successful franchise SEO campaign. Change comes from within, and you don’t have to sit still while the competition outranks you online. At the end of the day, all SEO – including franchise SEO – is about applying the basics and having the discipline and commitment to execute the right SEO and content marketing tactics week in and week out.